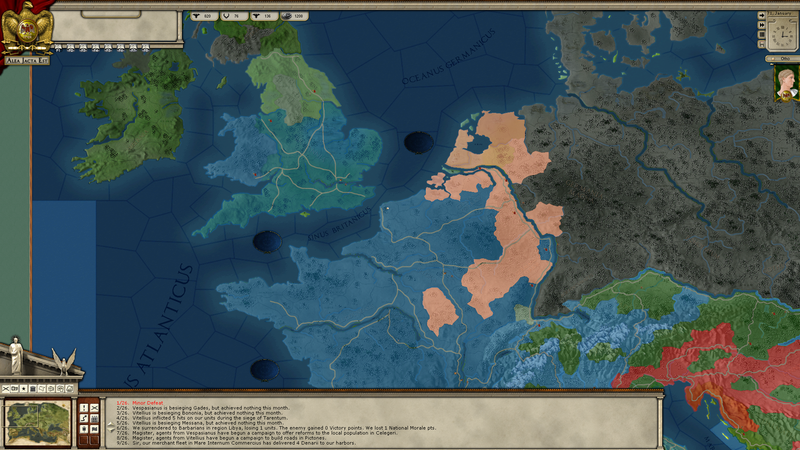 Just wanted to do a small write up of the Year of 4 emperor's campaign I played this week. 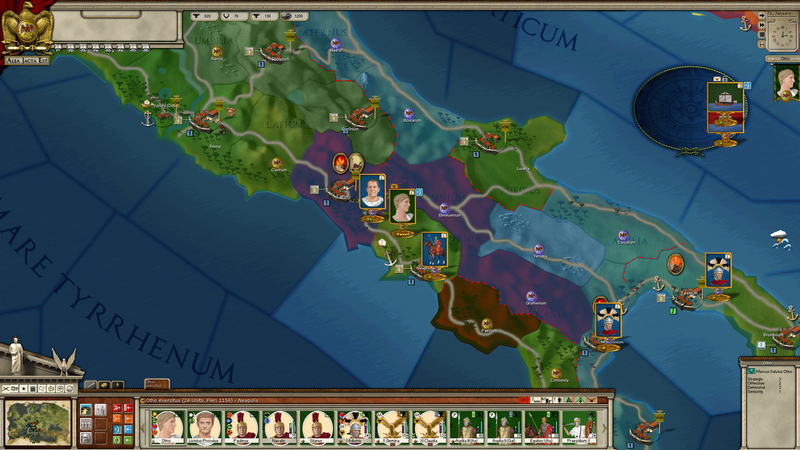 I played as Otho and managed to hold onto Rome despite lots of battles with Vitellus with often mixed results. 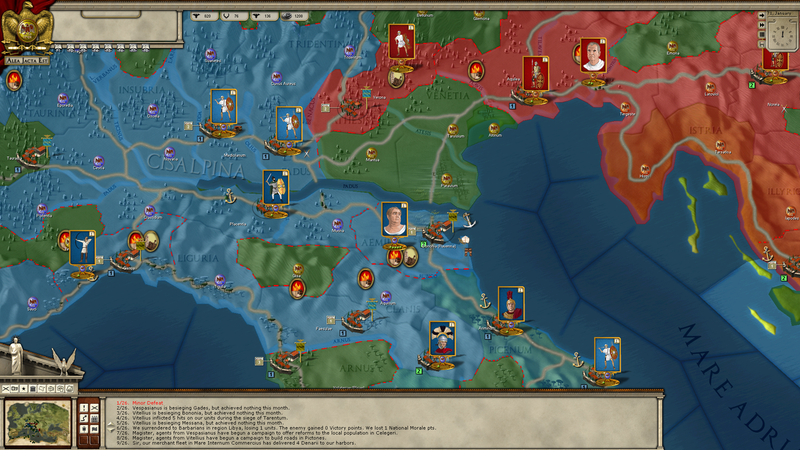 I lost Helvatia rather quickly as we were outnumbered by Vitellus's forces most of the Campaign. Vespasian approached Northern Italy near the end of the Campaign after suppressing most of the Jewish revolt. Parthia declared war on Rome but only managed to seize a few provinces. The Batavian revolt managed to really gain steam near the end of the campaign As Vitellus had abandoned Gaul in his mad pursuit of the Imperial crown. Rome was sieged several times but the Urban Militia managed to hold the city. I will post some screens of the Campaign with a small write up. The Praetorians dreams of seeing Otho return the Imperial unity were dashed with this defeat. Last edited by Comtedemeighan on Thu Dec 27, 2018 10:16 pm, edited 2 times in total. 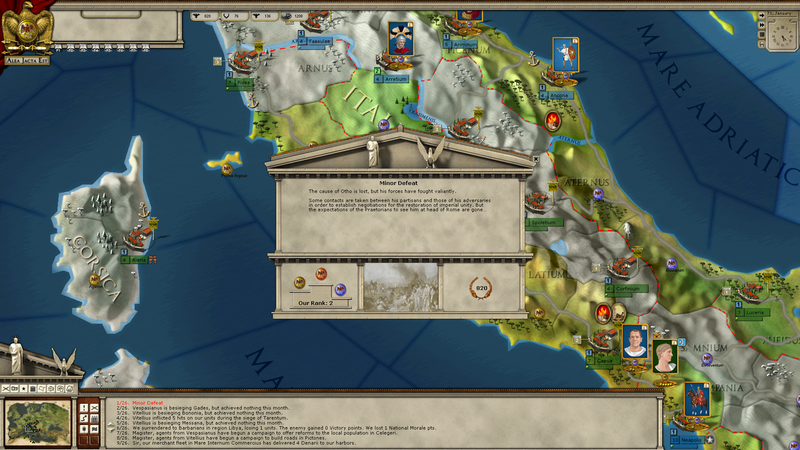 As you can see in Northern Italia came to be dominated by Vitellus. Otho just didn't have the numbers to hold off Vitellus and his hordes of Legionaries. I will say the Praetorian Guard and Otho aligned Legionaries fought quite well but despite their sacrifices could not win a decisive victory against Vitellus aligned forces. 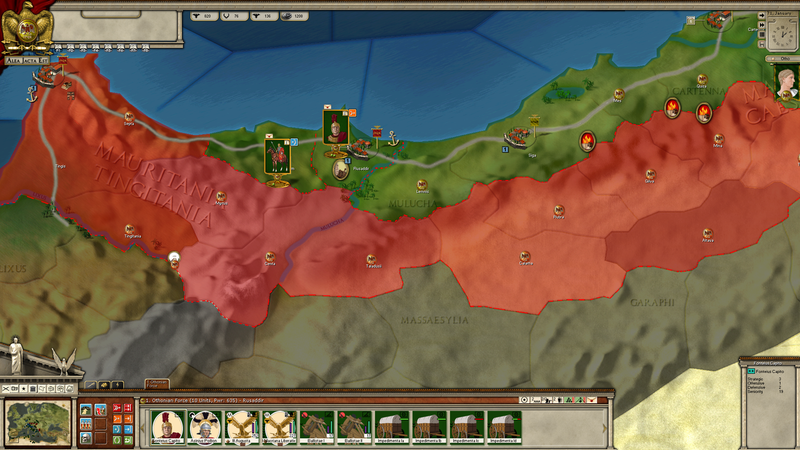 As you can see Vespasian's forces managed to show up near the end of the Campaign. I was really hoping they would fight Vitellus and buy us time. 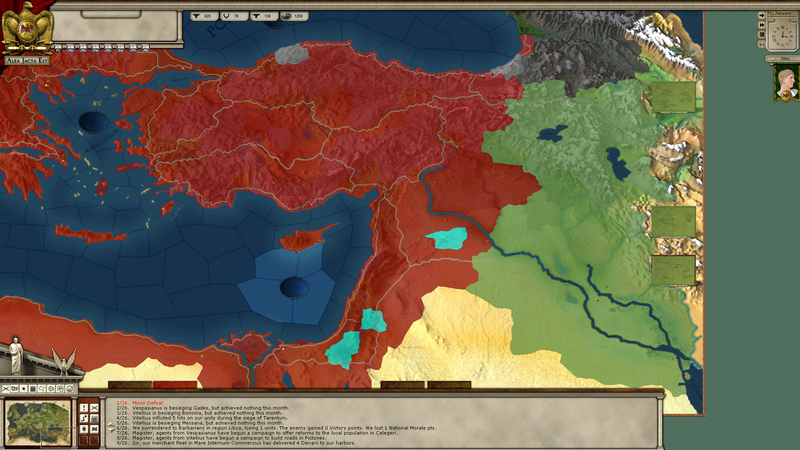 Also of note I tried to activate the Danubian legions but failed after many attempts. Otho retreated south to the area around Rome with most of the North occupied and supply getting scarce it was safer to be close to Rome. Managed to get Macer Assassinated in Africa and his Legions declared for Otho. Unfortunately I decided to take North Africa and didn't even think of using my Navy to bring this force to Italia where it would have helped out tremendously. Instead they just pushed West from Carthage and took out some small garrisons holding North African cities allied with Vespasian. Just a waste of time. Vespasian was still fighting pockets of the Jewish revolt as well as Parthia when the game ended. I didn't really pay attention to the Far East but I did notice Parthia grabbed a few provinces at some point. I would try this again as Otho and hopefully activate some of those Danubian forces. The Africa force should have shipped up to Italia that was a major mistake. All and all I would recommend this campaign it was a lot of fun to play. I find AJE to be one of the most accessible AGEOD titles and anybody on the fence about AGEOD games should pick this up in the holiday sale just to learn the basics of the system. Hopefully you enjoyed this brief write up of the campaign. Indeed, and thanks for the quick write-up. It's gotten a bit scarce with AARs on these forums, so even a little one like this is good to see - especially for a game with I own but haven't played much of. Which of the AJE scenarios would you recommend for starting out (against the AI)?